We are told by medical science that you’re five times as likely to live another year if you chat with a stranger while waiting for the doctor to see you. By this reckoning, we can safely assume that my mom is alive and kicking. That her spirit lives on, there can be no doubt. Look around you: You’d think we’re here to remember a fallen hero. And in a sense, we are. Ruth Rose Lehrer Stregevsky—Jewish name, Rivka Rochel—will be remembered as the consummate communitarian. And not just among Jews. Through her Christmas honey cakes, she nourished the spirits of her mailmen and garbage men. Through her bread crumbs, she nourished her feathered friends. Indeed, her 1963 letter to the editor, “Feed the Birds,” marked Ruth’s entry as a writer in public life. 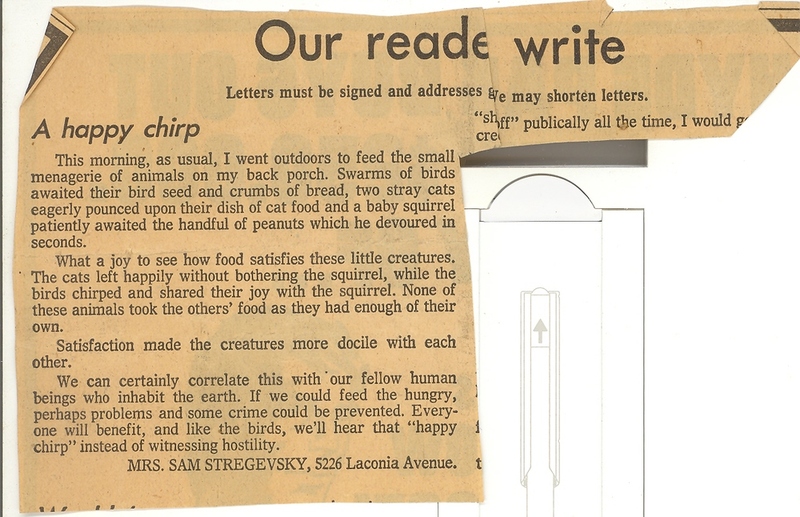 Ruth's second letter to the editor about feeding birds. And for half a century, public life remained her natural habitat. From the waiting room to the delivery room to the voting line, my mother reached out to strangers, and they to her. She was a lover at large. To her, there were no strangers; only friends she had not yet met. If Ruth had been trapped on an elevator, the riders would have asked their rescuers, “Can you come back later?” That’s how quickly she touched lives. 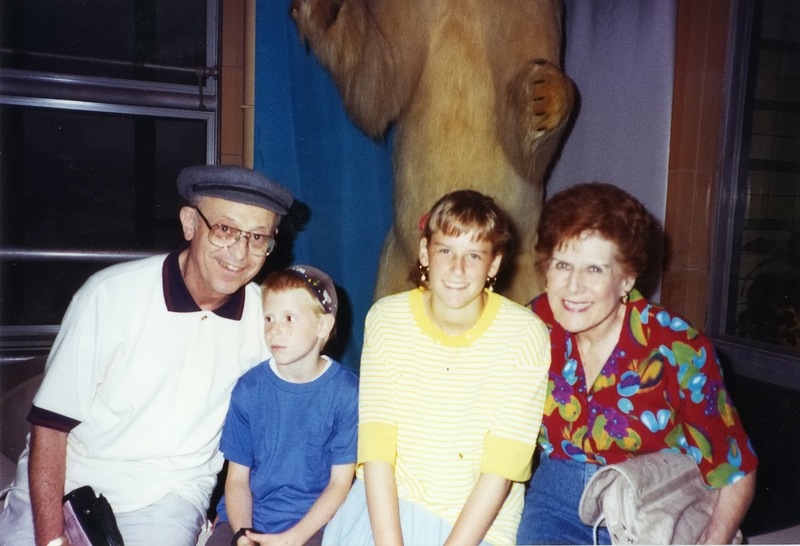 In her ninety-one years, my mother touched many lives, and many lives touched hers. Like Pal Joey, she would often say, “I could write a book.” And through her words and her deeds, she did. But her book remains unfinished. So today, let us together write the final chapter—the dénouement—of the Book of Ruth. In English, the word “ruth” means compassion for another being’s misery. In Hebrew, we’d say my mother had rach-MUH-nis. Long before affirmative action, she would go out of her way to hire handymen who were minorities. Once, in the late 1970s, our home was being painted by a crew of Russians, fresh off the boat. Their supervisor did not have their interests at heart. “How much are you paying them?” she asked him. “Six dollars an hour,” he assured her—good money, in those days. When they finished, my mom tallied their hours. She paid each worker his due, and paid their supervisor the balance. That’s how she ran her home. But home was just her base station. When her children’s school needed volunteers, she enlisted, writing letters, penning poems, baking cookies. When a candidate or a cause needed signatures, there was Ruth, clipboard in hand, mouth in gear. During the 24 years she spent raising her children, my mom found time to give to her community. But she would give even more in her autumn years. In her sixties and seventies, she was the playwright of choice for the Jewish Center seniors. There, her latent talents as a writer and actress reached full bloom. In more than a dozen musical shows, Ruth’s fetching scripts and guileless lyrics raised thousands of dollars while helping scores of seniors feel valued and young. Speaking of guileless: In 1995, I told my mom I was about to propose to my second wife. My mom—who had never met Lina—replied, “Uh, Paul, have you seen her without makeup?” Who but Ruth could get away with that? As Ruth entered her eighties, she stopped writing new plays. But she didn’t stop serving the Jewish Center seniors. Each week, they would look forward to her discussion class, The Think Tank. To prepare fresh material for each class, my mom would spend 10 to 15 hours. The hours took their toll, and I urged her to retire. But she wouldn’t hear of it. “They’re counting on me,” she’d explain. I could speak volumes about Ruth’s marriage to my father, Sam. But there’s little I could say that you don’t already know. Their marriage was an open book, and whatever they did, they did together. They volunteered together. Prayed together. They even entertained audiences together: Sam with his singing, Ruth with her stand-up comedy. She was the yin to his yang: she, the emotive romantic; he, the laconic scientist. Together, they raised two sons, a daughter, and a succession of cats. And for Ruth, raising the kids, and the cats, was not just a career; it was a calling. 1974 Stregevsky family portrait. Front : Sam and Ruth. Back: Barry, Diane, and Paul. With three growing children, my mom took motherhood seriously. She devoured parenting advice, from televised talk shows to newspaper columns and books. But no expert could prepare my mother for the difficult middle child who stands before you today. When I was 14, my mom asked Barry and me, “What are my three worst flaws?” My older brother had the good sense to say nothing. But our mom insisted we answer. “I won’t get angry,” she promised. I think you see where this is going. “But that’s not logical!” I protested. Showing love is what Ruth did best. Her children never wanted for self-esteem. Experts will tell you that’s a good thing (though Lina will tell you that in my case, it may have been too much of a good thing). Ruth has been buried next to Sam. My mother passed too soon to be remembered in next year’s Book of Life. But as long as her name means rach-MUH-nis, she will be remembered in The Book of Ruth. In a few minutes, we will proceed to the cemetery, where we’ll close that book. But before we do, let us write one last chapter: The epilogue. All the world’s a stage. 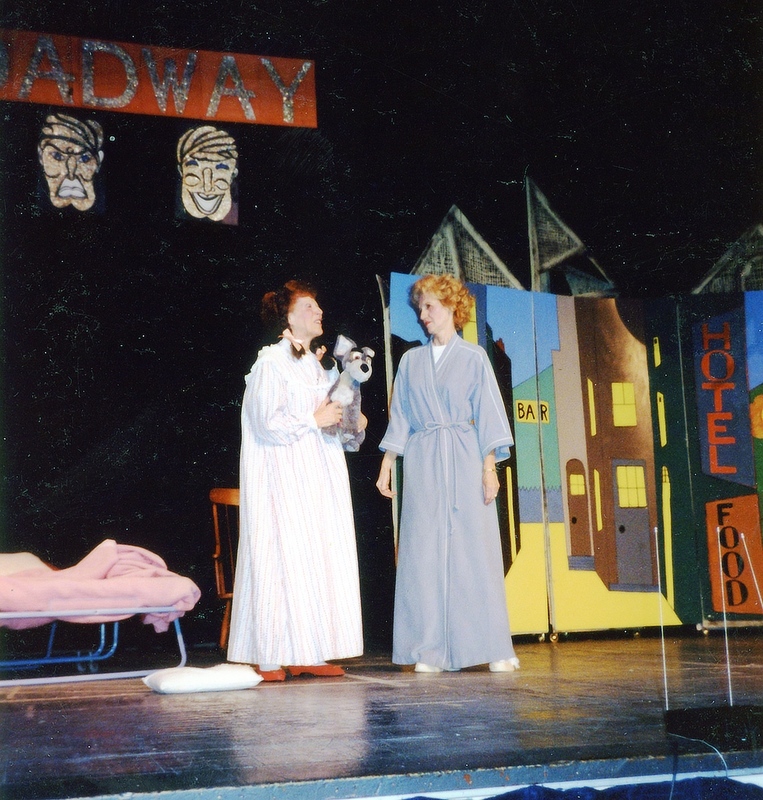 An aspiring actress, my mom was always on stage, eagerly playing a range of roles. But which role defined her? Devoted Wife, or Doting Jewish Mother? Political Activist, or Playwright? Community Volunteer, or Comedienne? The answer, if we’re honest, may be Comedienne. Ever the cut-up, Ruth was often likened to Lucille Ball. If not for the War, who knows? We may have tuned in to watch “I Love Ruth.” Imagine: Hollywood would have paid Ruth to be Ruth! Inside her was an actress who missed the stage. I often wondered how heavy were her regrets. But the big reveal came three years later, as we sat before our black-and-white television, watching Masterpiece Theater. A man in his fifties was shedding tears. His wife asked, “Dear, why are you crying?” And he answered, “I’m crying…for my lost youth.” Soon, my mom joined him. “What’s wrong?” I asked. “Oh, Paul,” she cried, “I miss my lost youth.” It would take a quarter-century, and a birthday cake that bore the digits Four-Zero, before I understood how stealthily our youth slips away. and “Dear Bob”: My Mother’s 1945 Letters to an RAF Serviceman. Click to leave a comment below. September 7, 2013 by Paul Stregevsky.